There is nothing more exciting than having 1000 pounds of bull moose aggressively responding to your call. 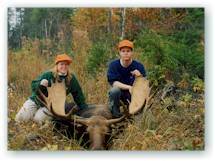 Lake Molunkus Sporting Camps is located in Wildlife Management District 11 and is situated in prime moose habitat. There is plenty of commercial forestland with access via hundreds of miles of gravel roads. Hunts are personalized to meet each permit holder's needs. We can provide a fully guided hunt, but a growing number of hunters wish to do the hunt on their own. This is certainly a possibility with the help of plenty of preseason scoutingand that's where we come in. We spend much of August and September in the field. This provides us with a knowledge base to put you in the best location for a successful hunt. The real work begins after you have the animal down. 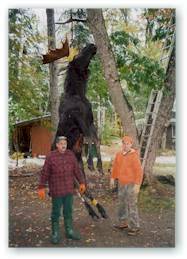 We have plenty of equipment and will offer our assistance to get your moose roadside, and then to the taxidermist and/or butcher. 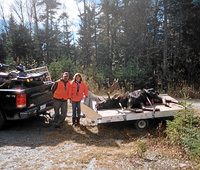 Moose hunting in Maine is by lottery-drawn permit only. The season runs for two separate weeks in late September and early October. Applications must be completed by mid May and the lottery usually takes place in June. To find out more, go to www.maine.gov/ifw/licenses_permits/lotteries/moose/.